On the return flight of his recent trip to Europe, TPG Contributor Jason Steele had the chance to try out LOT’s Business Class from Warsaw to New York (JFK). Here’s his experience on this Polish carrier. Sure, the 787 Dreamliner has been in service (off and on) for nearly three years, but it’s still a treat for me to fly on Boeing’s newest wide-body jet. In fact, I haven’t been on board a Dreamliner since TPG and I were on the Star Mega-Do 4 charter, and that was only for two short-haul domestic segments in coach on United. That’s why my family and I were especially excited to return from Europe on LOT Polish Airlines, which offers twice daily service from Warsaw to New York’s JFK airport. We knew that we’d be flying on Dreamliners since LOT is the only airline to have finished converting its entire long haul fleet to that aircraft (Norwegian initiated its first long-haul service with a fleet of Dreamliners as well). 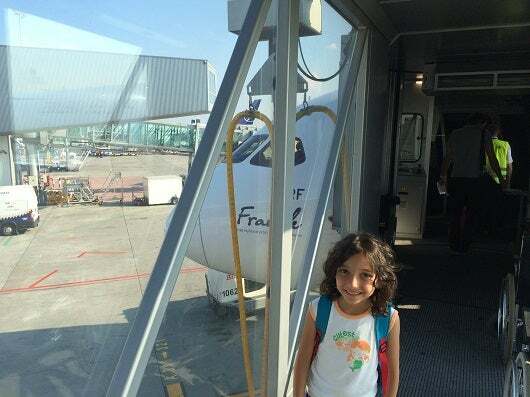 There are dozens of different carriers that could have gotten us home to Denver from our recent family vacation in Italy, but the real challenge was finding four award seats from Europe to anywhere in North America during the summer with just three months notice. Thankfully, we found business class awards on LOT to be somewhat plentiful, perhaps because LOT’s long-haul award space is not visible when searching United.com, or maybe because LOT serves New York from JFK, which has very few Star Alliance connections compared to United’s hub at Newark. So we were thrilled to book four seats on one flight from Milan to Warsaw, as well as four business class award seats on 787s continuing on to JFK, albeit on separate flights. We were able to start our journey on the same flight to Warsaw, and then split the team onto different flights to JFK, with the outside chance that we could all standby for the same flight. In the end, LOT gate agents seemed willing to allow two of us to standby for the earlier flight, but the flights were full. Boarding the Dreamliner. Gotta love the glass jetway! To book the flights, we pooled our American Express Membership Rewards and Starwood Preferred Guest accounts by transferring to Air Canada’s Aeroplan program. Thankfully, Air Canada offers one-way awards from Italy to the United States for just 45,000 miles each. Once we identified award space on ANA’s site, I had to call Air Canada to book it, since their web site didn’t properly display the space. Taxes, fees, and fuel surcharges added up to only $80 per person each way, expenses which are eligible for reimbursement with miles from Capital One Venture Rewards Credit Card or the Barclaycard Arrival Plus World Elite Mastercard. United. By transferring Ultimate Rewards points to United, we could have booked a one-way partner award flight for 70,000 miles each, but with no fuel surcharges. Singapore. Points transfer to Singapore from American Express Membership Rewards, Starwood, Chase Ultimate Rewards, or Cit ThankYou Rewards. A one way award would have been 75,000 miles plus fuel surcharges. Miles and More. LOT is part of the Mile and More program, but charges 75,000 miles for premium class flights between Europe and North America, plus fuel surcharges. ANA. I could have used 63,000 ANA miles by transferring them from Starwood or American Express Membership Rewards. The biggest problem we had was the lack of any domestic award seats from New York to Denver on United, in any class of service from any New York area airport, so we had to book a separate award on Southwest out of La Guardia. However, with our two Southwest companion passes, it didn’t consume too many points for the four of us to book the positioning flight the next day. After arriving on-time on our LOT flight from Milan, and gawking at a few Soviet era aircraft on the field, we were pleased to find Warsaw’s Chopin airport to be clean, modern, and relatively compact, with even a few children’s play areas to boot. 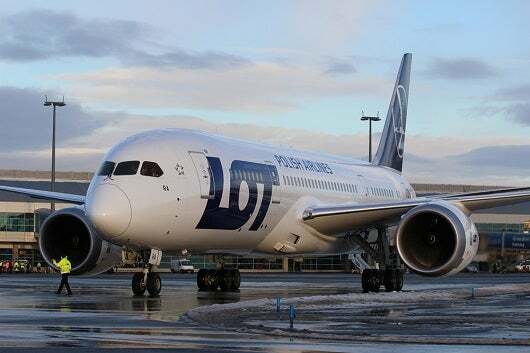 LOT is the only long-haul carrier serving Warsaw, and its only other long-haul destinations are Chicago, Toronto, and Beijing using its fleet of just six Dreamliners. 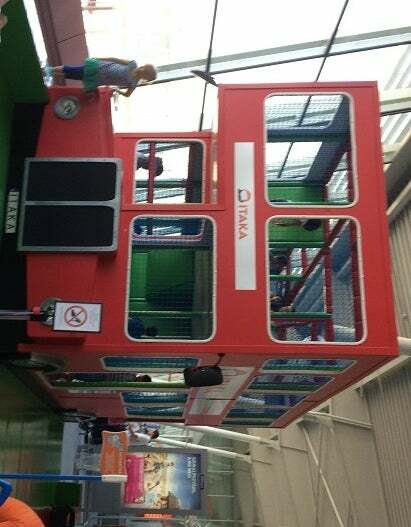 One of the children’s play areas in the Warsaw airport. My wife and our 2 year old daughter took the 1 pm departure to JFK, while my six year old daughter and I met her in New York after taking the 5:30 pm flight, and spent the afternoon in Warsaw’s Copernicus Science Centre, about a half an hour away in downtown Warsaw. Once we were reunited at our hotel in New York, we compared notes and realized that we both had similar experiences. Both flights boarded, departed, and arrived on-time, and we both found service in business class to be friendly and efficient, without any over the top embellishments. Boarding in Warsaw was from the most forward door, so that all passengers in premium economy and regular economy streamed by us for some time after we had taken our seats. Nevertheless, the crew was able to offer us a pre-departure beverage of water, juice, or champagne. Speaking with friends who have flown LOT and reading other reviews, I had pretty low expectations for the meal service, but again, we were pleasantly surprised. Dinner began with a pre-meal aperitif of some sort of shaved meat on a cracker, presumably a Polish version of prosciutto. Our choice of appetizers included roast beef with Parmesan cheese and sun-dried tomatoes, or Sorrel soup. Unaware at the time of what Sorrel was, and with our flight attendant lacking the English vocabulary to describe the soup, in the spirit of adventure I gave it a try and found it to be quite good. Only later did I learn that this is a traditional Polish dish made with eggs, croutons, and the leaves of the Sorrel plant, which is a local herb. Our main course choices included a salmon filet with buckwheat soba noodles, chicken with mushrooms, or a pork loin dish. My oldest daughter and I found both the salmon and chicken to be a bit dried out, but edible, while my wife on the earlier flight, found them to be a lot better. My guess is that all of the meals were prepared at the same time, so ours was just four and a half hours older. Dessert was a choice of a cheese plate or a mango and vanilla ice cream sundae. I loved the cheese plate, while my daughter had no complaints about the ice cream (hard to believe, I know). I also enjoyed an after dinner drink of a nice Polish liqueur. 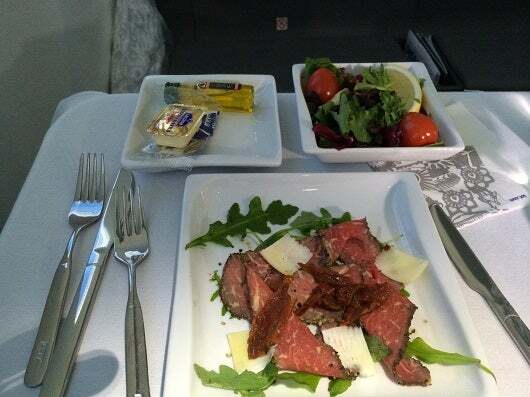 Interestingly, economy passengers on LOT can order the premium class meal service for an additional $30. A later snack service was provided, but frankly, all of us were well fed and happy to sleep through it. Once the entertainment system was enabled, my daughter and I enjoyed a modest selection of 24 different movies, as well as some games and music. The fully horizontal lie-flat seats were spacious, comfortable, and easy to use. At 5’10, I was quite comfortable, but I estimated that those over 6’2″ might be a bit cramped. Power was supplied by USB and standard power outlets, with no adapters needed for standard American or European power cords. When Boeing announced that Dreamliner crews would have the ability to control passenger’s window shades, which dim electronically, I feared that some carriers would abuse this feature. While it was not a problem during the Mega-Do flights, my fears were realized on this trip. Passengers were locked out of using the electronically activated window shades not just during taxi and takeoff, but for for about an hour after we reached cruising altitude. With the sun shining directly on me through the aircraft’s enlarged windows, and the flight approaching the coast of England, I had to ask the crew several times to re-enable passenger controls of the windows before I was able to dim the ones next to my seat. Similarly, the in-flight entertainment system was turned off before takeoff and not re-started until after I requested it. 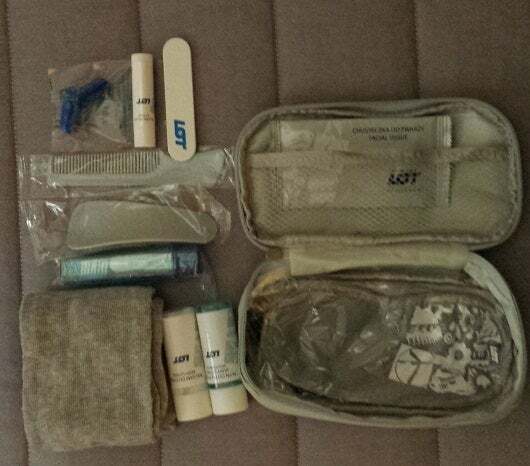 I could chalk this up to a forgetful crew, but my wife noted the same issues on her flight. LOT Dreamliner business class seats. As long as you know how to find award space on LOT, there are several different ways to redeem your flexible reward points for their flights. With top of the line equipment, decent food, and efficient service, we wouldn’t hesitate to choose LOT in the future when it fits our award travel needs. Have you flown on LOT airlines before, or do you have plans to fly LOT in the future? Please share your experiences, questions, and recommendations in the comments below!